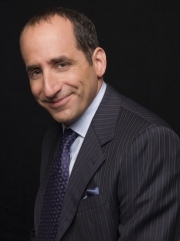 Peter S. Jacobson is an American film and television actor. Jacobson was born to a Jewish family in Chicago, Illinois, the son of Chicago news anchor Walter Jacobson. He is a graduate of Brown University and Juilliard . In 1997, Jacobson and Lisa Edelstein, his future co-star on House, appeared as a couple eating at a restaurant in the film As Good as It Gets that is assailed by an anti-Semitic tirade from Jack Nicholson's misogynistic character. He has played a recurring role on Law & Order as Randy Dworkin, a jovial crusading defense attorney attached to various causes. In 2005, Jacobson played "Jimmy" in the Academy Award-nominated film, Good Night, and Good Luck. He has appeared on Scrubs, CSI: Miami, The Lost Room, The Starter Wife, Transformers and The Midnight Meat Train. He joined the cast of House as Chris Taub, a plastic surgeon hoping to make Gregory House's diagnostics team. In October 2007, he was confirmed as a regular on the show. He made a guest appearance on an episode of the USA Network's Royal Pains as Alan, the nebbishy husband of Rachel, played by Brooklyn Decker. Whole or part of the information contained in this card come from the Wikipedia article "Peter Jacobson", licensed under CC-BY-SA full list of contributors here.